Kochi: The lion-tailed macaque is a shy creature, sticking to the trees and avoiding human contact for the most part. Easily identified by its white “beard", it’s one of the most endangered primates on the planet. About a quarter of a century ago in Kerala, the animal symbolized a battle for hearts and minds, characterized as a conflict between “good" and “evil". Ground zero of the battle ground was a place named for the absence of sound—Silent Valley. The nice guys were the environmentalists, poets, artists, academics and thousands of school and college students energized by a cause they could identify with and came to call their own. The bad guys were greedy politicians, the timber mafia and a corrupt state electricity board in hock to both. On 15 November falls the 25th anniversary of this triumph of good over evil, which showed that people power could be successfully mobilized over issues such as environment and not just roti, kapda and makaan. The movement permanently shifted the equilibrium of the debate over environment, making it difficult for green-unfriendly measures to succeed in the state. To be sure, 25 years on, Kerala’s environment is getting polluted like any other Indian landscape, with its verdant greenery being consumed into one giant urban sprawl that extends from north to south. But in those heady days, a quarter of a century ago, anything seemed possible. “Those were times when any movement, be it environment conservation, the extreme Left, women’s empowerment etc., all were in their infancy and had the heat and fervour and dynamism," said K. Ajitha, former Naxalite who shook the citadels of power in the 1970s and now leads a women’s movement known as Anweshi. “But as the days passed, communalism and corruption, which was then confined to the leadership, started getting down to the grassroots level and that explains the lack of any coordinated effort to fight for a socio-politico-economic cause, though movements are still active sparingly and only in pockets." While the Kerala State Electricity Board first proposed a dam across the Kunthipuzha river as far back as 1958, the first trees began to be felled in 1973. Over the next few years, there were sporadic protests over the plan. Four years later, then electricity minister P.K. Vasudevan Nair travelled to the national Capital seeking approval for the dam plan. At about this time, V.S. Vijayan, a scientist at the Kerala Forest Research Institute (KFRI), sent a telegram to the Union power ministry, pleading that it hold off from clearing the project until his agency’s ecological report was completed. Vijayan’s note was convincing enough for the power ministry to send Nair away empty-handed. The minister’s failure gave heart to the still-evolving resistance against the 120MW hydroelectric project that would submerge a 240 sq. 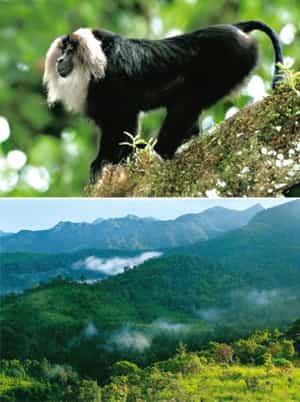 km area along the Western Ghats that formed one of the most ecologically diverse forests on the planet. The KFRI report that came three months after Vijayan’s telegram was damning about the environmental impact of the project. After submitting the report, Vijayan, who had earned the wrath of the Kerala government, quit to join Salim Ali, renowned as the Bird Man of India, at the Bharatpur bird sanctuary in Rajasthan. “It was a most wonderful thing to help protect Silent Valley, home to 15 endemic varieties of birds," Vijayan says. “I am not sure whether I will act in the same manner now. Then I was young and did not mind risking my job." Buoyed by Vijayan’s success, non-governmental organizations such as the Kerala Sastra Sahitya Parishad (KSSP), a movement of teachers and students that later came to be closely associated with the Communist Party of India (Marxist), or CPM, and the Kozhikode chapter of the Kerala Natural History Society swung into action. School and college students and teachers led marches to the Silent Valley, distributed pamphlets and staged street plays to steer the mass movement, recounts M.K. Prasad, president of KSSP between 1979 and 1981. The poem Marathinu Stuthi (Ode to a Tree) by Sugathakumari—one of the key figures in the environmental movement—achieved a totemic status, being recited at the start of all campaign meetings. Prasad was also able to win over people with clout in the national Capital, including K.P.S Menon, former ambassador to the erstwhile Soviet Union, who had settled down in his home state. Menon wrote to then prime minister Indira Gandhi seeking her help in protecting the rainforests. Ali, also someone who had Gandhi’s ear, once trekked across the valley with R. Sugathan, an ornithologist at the Thattekkad Bird Sanctuary near Kochi, in the late 1970s. Sugathan remembers how Ali described Silent Valley as “not just an evergreen forest, it is a very fine example of one of the richest, most threatened and least studied habitats on earth". Ali made his views clear to Gandhi, who asked M.S. Swaminathan, then secretary in the department of agriculture and renowned for his critical role in India’s Green Revolution, to visit the site. Swaminathan recommended that the project be abandoned and suggested developing Silent Valley and the adjoining forests as a national rainforest biosphere reserve, giving the campaign a shot in the arm. All this while, the Kerala government was intensifying pressure on the Centre to clear the project. There was a rare consensus on the project between the two main traditional political rivals in the state. Both the CPM and Gandhi’s own Congress party wanted the dam. Critically, though, their student and youth wings rebelled against the party line and backed the green movement. Gandhi constituted a multi-disciplinary committee headed by M.G.K. Menon, then secretary of the national committee for environment planning and conservation, to examine whether the project would be feasible without causing any significant ecological damage. The committee said the dam would cause irreparable damage to the ecology and advised the Kerala government to abandon the project, suggesting an alternative site in Idukki district. In September 1984, Gandhi formally scrapped the project. A month later, she was assassinated and the Capital was convulsed. The bloodletting in Delhi didn’t stop the declaration of Silent Valley as a national park on 15 November. A year later, Rajiv Gandhi, her son and successor as prime minister, inaugurated the park. “By having the hydel project, the power picture would not have changed much, except that a vast tract of forest would have been destroyed," says M.G.K. Menon. He is happy to have played a role in a campaign “that had a profound bearing on the conservation movement in the country". Kerala’s forest minister Benoy Viswam, who was instrumental in adding 148 sq. km outside the core forest area as a buffer zone for the park, sees the movement as a training ground for environment protection and conservation. 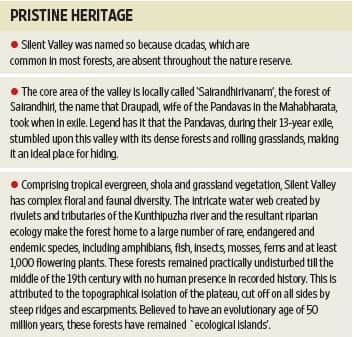 Darryl D’Monte, environmentalist and author of Temples or Tombs–Industry vs Environment: Three Controversies, calls the Silent Valley campaign a path-breaking movement that set the template for future agitations. “The KSSP that piloted the movement was a unique model environment organization with a blend of grass-roots activists and scientists," he said. S. Shivadas, the present warden, wants more of the surrounding area to be brought within the park’s ambit. “We must bring similar rich bio-diverse areas in the vicinity together." The Silent Valley movement was also the precursor to other conservation campaigns, such as the one against the Tehri dam in Uttarakhand and the Narmada Bachao Andolan against the massive Sardar Sarovar project that covered the states of Gujarat, Maharashtra and Madhya Pradesh. While those protests failed to stop the dams being built, the Silent Valley movement made it difficult for such ventures in Kerala, although hydroelectric projects still do get proposed (and shot down) in the power-deficient state. Proposals for dams that would submerge forests at Pooyamkutty in Idukki district, Athirappilly in central Thrissur district and Patrakadavu adjacent to Silent Valley haven’t progressed beyond the drawing board. Vijayan is today back in a state government role as chairman of the Kerala state biodiversity board, still actively fighting against dams. Although he’s been a resolute opponent of the hydel project at Athirappilly in central Kerala, Vijayan laughingly says he doesn’t fear the loss of his job this time around, a reflection of how green issues have become part of the political mainstream. A key milestone during the Silent Valley campaign was the Forest Conservation Act, promulgated in 1980. “The shifting of forests from the state list to the Concurrent List made Central government sanction mandatory for diverting forest land for non-forest uses," said S. Shankar, a senior scientist at KFRI who also played an active role in the movement. This marked the birth of the “economics of nature conservation. It was the first move to give some value for nature". The movement had gained global attention two years before that with the International Union for Conservation of Nature, a coalition of governments and agencies committed to environment protection, passing a resolution recommending protection of the lion-tailed macaque at a meeting in the then Soviet Union in 1978 . The Kerala government itself plans to celebrate the silver jubilee by felicitating all those who steered the campaign against the hydroelectric project. Jairam Ramesh, minister of state for environment and forests, will lay the foundation stone for an interpretation and research centre at Mukkali, the base station for the park. This is intended to function as a resource centre displaying images and details of the flora and fauna found in the park and be a centre for students to undertake research programmes. The minister will also release a postage stamp on the Silent Valley National Park. The celebrations include film shows, exhibitions and street plays in schools and colleges across the state to create conservation awareness among children. “The park is now synonymous with the people’s movement and an inspiration for conservation," said T.M. Manoharan, principal chief conservator of forests, Kerala.